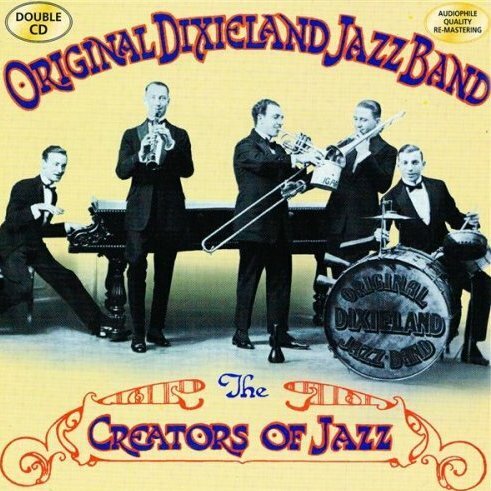 Original Dixieland Jazz Band – The original members formed the band in 1916. 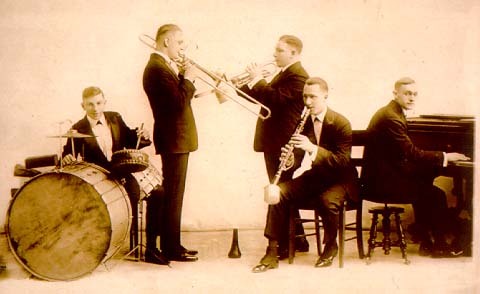 ODJB is credited with being the first to record jazz commercially and to have hit recordings in the new genre, The term in the name was originally “Jass” rather than “Jazz” but the label of an early Victor recording of “Tiger Rag” shows it had been become “Jazz” by 1917. Tiger Rag (m. Edwin B. Edwards, Nick La Rocca, Tony Spargo & Larry Shields, w. Harry De Costa) – The songwriting credits went to the members of the ODJB. Credit is certainly in dispute as you can see in the brief history by JazzStandards.com here: Tiger Rag. The song was composed in 1928 for Lew Leslie’s Blackbirds of 1928, a show which also also introduced two jazz standards by McHugh and Fields, “I Can’t Give You Anything But Love,” and “I Must Have That Man,” as well as the hit “Diga Diga Do.” Despite the word “new” in the title, the great songwriting team have here fashioned an archetypal Jazz Age song with strong echoes of iconic hits of the age such as “The Charleston” (1923), “Has Anybody Seen My Gal?” (1925), and “Yes Sir! That’s My Baby” (1925). The links under “Features” below are to Songbook pages, while those under “External Links” go to external sites and resources. Jimmy McHugh and Dorothy Fields: the standards 1928-1935 – Their early compositions as a team are within the Jazz Age era, particularly two hits and two standards from 1928. Louis Armstrong and his Hot Five, 1926 selections — Armstrong is also present, as noted in the musician credits, on several recordings in our first Bessie Smith feature page. The Development of an African-American Musical Theatre 1865-1910, from the American Memory collections of The Library of Congress website. This article has divided the timeframe 1865 to 1910 into six chronological parts. Each section contains a brief summary of developments in African-American musical theater during the period in focus, and sheet music for notable songs within the period. Noteworthy vaudeville shows and musicals are briefly described, and principle composers of musicals and other stage shows, songwriters, and performers are identified.